In both Wimborne and Christchurch, the annual pancake race will be held for competitors to crepe their way to the finish line in this flipping fun event. 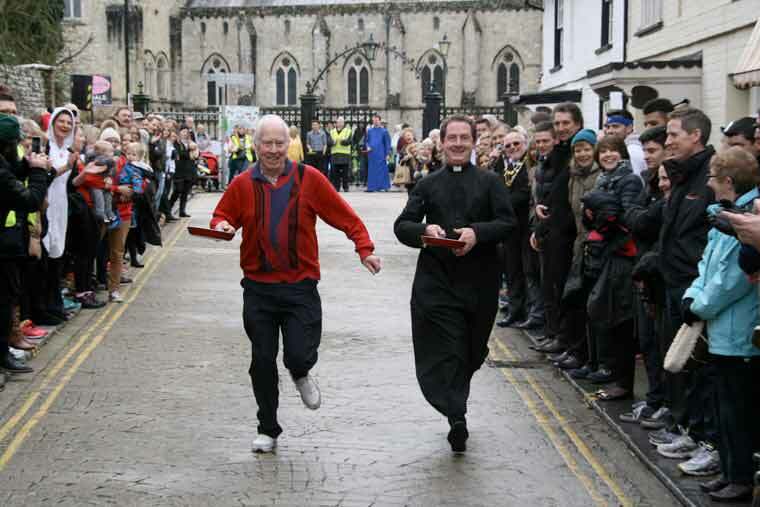 The Pancake Race around Wimborne Minster is all set to run tomorrow and will be the twentieth race since it was revived in 1998, after an absence of some 16 years. The race takes place at 11am and the venue is outside the main entrance to the Minster. The first heat will be run whilst the Pancake Bell is tolled. All competitors should report to the North Porch by 10.30am to enrol, complete with frying pan and ready cooked pancake. Challengers (over 18) can win The Old Bakehouse Café Perpetual Challenge Cup and become the Minster Pancake Champion 2017. The winner will also receive a Trophy. In addition to the Adult races there will be races for those under 18, these being split into three age ranges, 4-9, 9-13 and 13-18 together with races for toddlers and pre-schools. Prizes will be awarded to the winners of each category. If there are enough entries, as there have been for the last few years, there will also be a Wheelchair Race and the Wimborne Pet Centre will donate a bag of wild bird food to the winner. All competitors have to do, is run round the Minster, starting at the North Porch tossing their pancakes at the four corners of the church. Anyone can enter their respective categories — male or female, young or old, individuals, schools, groups and organisations – all are welcome. You can just turn up on the day if you’d like to take part. Book in for registration by 10.30am. Meanwhile the pancake race in Christchurch will see the old bowling green area opposite the Kings Arms Hotel transformed into a race track as chefs, business people and local celebrities grab their frying pans and toss their way to victory in the pancake races. The Christchurch Food Festival is holding the pancake races on Shrove Tuesday to benefit its charity, Christchurch Food Festival Education Trust. Races start at 10.30am. Building on the success of previous years’ events, the Food Festival committee hopes to encourage more teams to enter this year to raise more money. Entrance fee for teams of four is just £20 while individual chefs are also being encouraged to enter for £5. Last year’s event saw Penton Motor Group taking the top team prize while Louis Smith, chef at Cheese & Alfies, won the individual chef event. Vicki Hallam from the Food Festival committee, said, “We’ve moved the pancake races from our previous venue in Church Street to the old bowling green to give the teams a bit more space. We’re very grateful to the Kings Arms Hotel for allowing us to use the space.